Terriers have announced their 2018-19 full schedule with 34 regular season contests and two exhibitions. Along with 24 Hockey East games, there are ten out-of-conference games: Minnesota State (2), Friendship Four Tournament in Belfast (UConn, Yale/Union), Dartmouth, Harvard, Arizona State (2), Beanpot (2). The home exhibitions with Acadia and USA Hockey’s NTDP U18s. First-year coach Albie O’Connell will meet with season ticket holders and members of Friends of BU Hockey this week. Freshman forward Joel Farabee, after a strong performance at Flyers development camp, talked about his Philly family ties and goals for his first year as a Terrier. Farabee was the #14 overall pick in the 2018 NHL Entry Draft --same as Kevin Shattekirk in 2007 and Charlie McAvoy in 2016. Who are the eight Terriers selected higher than #14 in the NHL draft? 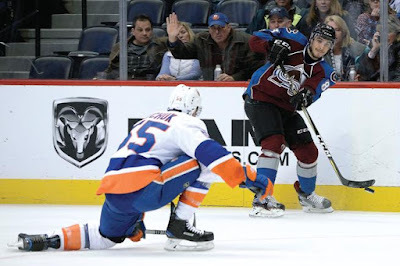 Former Terrier forward Matt Nieto, coming off his best NHL goal-scoring season, re-upped with the Avalance, signing a two-year deal for $3.95 million. 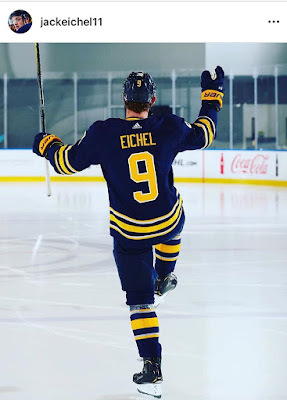 Jack Eichel will be wearing #9 for Buffalo, switching from #15 to the number he flashed as a Terrier. Wakefield, Massachusetts native John Lilley, who played at BU before pro career, is the new Director of Amateur Scouting for Toronto Maple Leafs. Promoted from Top US scout. Former Terrier Head Coach Jack Kelley, who led BU to back-to-back National championships in 1971 and 1972, turns 91 this week. The Athletic’s Joe McDonald caught up with him in Maine to talk BU and NHL hockey..